Wired reported, SPIEGEL ONLINE reported, Adobe contributed, Twitter and Facebook went crazy like hell — it’s like half of the world discusses the colors of a dress today. One thing upfront: no sensation here, at all. The level of “virality” of this story and its scientific impact are not related. Still, there are various important aspects about this topic which I want to bring into order and contribute to the discussion. how easily people can get biased (how many of us are not able to grasp an independent thought). how many of us are not able to isolate the actual facts and to neutrally reflect them. how difficult it is to grasp seemingly simple concepts. Science is a method of discovering reliable knowledge about nature. There are other methods of discovering and learning knowledge about nature, but science is the only method that results in the acquisition of reliable knowledge. Reliable knowledge is knowledge that has a high probability of being true because its veracity has been justified by a reliable method. This is vague, but this really is the main idea. It is up to us to fulfill this criterion, and obviously this requires some knowledge about how things really work. How dare you. Point missed! Providing insights in this topic is not done by telling people how their brain should work. Providing insight is done by telling them what it actually is that enters their eyes. Beyond that boundary there is no binary distinction between right and wrong (nor between black and white, pun). So, the Wired article on the topic does not construct a convincing chain of causality. The one thing they got right is that colors are interpreted by brain depending on the environment. 1. Colors are interpreted by brain, depending on environment. Not fully understandable, but appreciable. 2. The dress is either white/gold or blue/black. One of these solutions is correct. The correct solution can be inferred from the photograph. Some people see the correct solution, others are wrong. This is wrong and problematic in different regards, as I will explain this further below. The dress story got so much attention, largely because these two concepts were mixed. One of the concepts obviously is right. The other concept is, unfortunately, not obviously wrong to many people. In combination, both concepts suggest even more magic than there really is. So the debate got heated up. This white-balance illusion hit so hard because it felt like someone had been playing through the Monty Hall scenario and opened their chosen door, only to find there was unexpectedly disagreement over whether the thing they'd revealed was a goat or a car. Please, chew on that, for a minute. Randall suggests the following scenario: What is behind the door? Car or goat, car or goat, car or goat, car or goat? Now you open the door. And you might say: oh, I am not sure whether this is it a car or a goat. And you think you now have to decide between both, because car is great, and goat is bad and everything else is not important. You have lost capability to see and realize that it is neither of both. People are so focused on seeing either of car or goat that they lose their ability to judge neutrally what they see. This is Randall’s way of criticizing how people are asked about this very dress issue and about how media fails in attempting to resolve this issue. Media is creating a bias in this discussion, which clearly prevents a neutral analysis. In fact, what happened is a phenomenon that can be described as social self-amplification, converging towards a tremendous simplification of the problem, and towards the wrong questions being asked, eventually yielding the seemingly only viable options of white/gold vs. blue/black. Rollback. By now it is clear that we should forget about white/gold vs. blue/black, and focus on what we actually see. This might read trivial, but is the primary insight for treating this topic on a scientific level. For those seeing #WhiteandGold in #TheDress (http://bit.ly/1APDFay ), @HopeTaylorPhoto ends the debate. they made a fool of themselves and approached the problem at a wrong level, not looking at the entire flow of information. The essential concepts for assessing the dress color problem, distributed over four levels of information flow, are not that complex and shall be discussed within the next few paragraphs. Depending on the exposure and white balance settings, a camera records very different images of any given scene. You do not need to exactly understand what these two things mean. You just need to appreciate that color and brightness as recorded by the camera might be very different from what a human being would have observed in position of the camera. Simple, right? Then, once the image has landed on a computer, it can be edited. In any way. The first two points from the list above boil down to the following conclusion: a photograph that you did not take yourself and that you did not digitally edit yourself might show anything far from what the actual, real scene looked like to humans. Still simple, so far. I think the most important conclusion from here is: based on a random image circulating the Internet, it is pointless to discuss which color the dress really has. This might sound nitpicky to you, but in fact this relaxes the problem a lot. The important insight from here is that asking for the real color of the dress is an ill-posed problem. It is a waste of time to even think about the real color of the dress. A valid question left is: what color does the dress have in the image? I fear that my last point might still might appear a little nitpicky. But it is essential, so I’ll use a second approach: there is no point in interpreting this photograph with respect to the real lightning. The flow of information from the real scene towards the digital photograph implicates a loss of information. This is irreversible. Furthermore, the information that is contained in the image underwent transformations whose details we do not know (remember: we did not take and edit this photo by ourselves). Hence, the remaining information can not be used to make resilient conclusions about the lightning in the real scene. The point is: if you want to approach this scientifically, forget about the real scene, really. I mean, you can do whatever you want, but if you incorporate the real scene of the dress photograph in your thought process, then you are making unsupported assumptions and leave the scientific regime. When one follows this logic, the only valid way to answer this question (“what color does the dress have in the image?”) is to quantify the colors in the image. Quantification usually happens through “measurement”, which is an important concept in science. During a measurement, a certain quantity is determined. The measurement yields a number, and the number has a unit. Measuring should exclude experimental errors as far as possible. Naturally, a measurement transforms one type of information into another. Now, you might just use a calibrated screen and a calibrated camera and then display the image on the screen and then point the camera to the screen and then measure colors. Or you stop over-interpreting this very simple problem and realize that in this case there is no need to transform information another time. The information we are interested in (the colors in the image) are already there. In the digital image file. Just read them out. There is no point in performing another measurement. 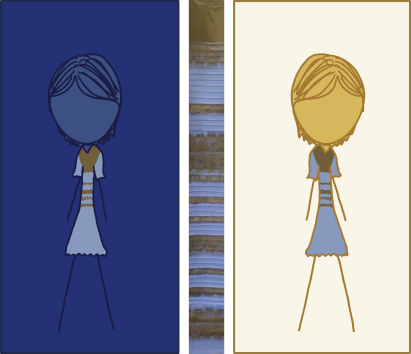 Given the dress photograph as data source, we now have (scientifically) obtained a conclusion (you might want to name it a “fact”): The two main colors of the dress in the image are blueish and brownish (the RGB unit system is unambiguous, and its transformation to “words” at least follows a reproducible system, by neutral standards). The remaining level of information flow happens within the brain of the one observing the image. Clearly, there is an interesting relation between the distribution of colors in the image (not in the scene, in the image), and human perception/imagination of the two main colors of the dress in the real scene. I appreciate that when forced to imagine how the dress might have looked like in reality, certain people argue that they think it was white/golden or blue/black. Fine with me, and I believe them: Clearly, this particular image has a weird light constellation, so that it requires a huge amount of extrapolation towards imagining the real lightning in the real scene. A huge amount of extrapolation based on bad data yields an unstable result, even when using a computer and a numerical approach. Now, this is not a computer. This is brain. Higher complexity, many more degrees of freedom and clearly a larger potential to end up with different outcomes when extrapolating. Same person, different attempts, different outcomes. Different persons, different outcomes. Really, this is not surprising, and there is not right or wrong, because the underlying data is bad. I asked myself: which colors do I see in the picture? Honestly, “blueish” and “brownish” were the colors I saw. I actively denied to think further than that, because I knew that it does not make sense to over-interpret that picture. Because so much information was lost on the way from the real scene towards the image on my screen. Because, obviously, this is a bad photograph. You know that when you work with photographs. And when I looked at this picture with friends and we discussed which colors we really see (without thinking), everybody agreed on seeing blueish/brownish. or a complex extrapolation thought process (subconscious or not) with the goal to identify the real scene lightning. The latter is, as argued, an ill-posed problem and people are weighting different aspects of this thought process differently, which is why the outcome is different. Media turned this whole story into something that looks super magical, because asking whether he/she thinks if the dress is white/gold or blue/black and suggesting that only one solution is correct is very different from asking “which colors do you see?” and manipulates people. This entry was posted in General, Photography, Science on February 27, 2015 by Jan-Philip Gehrcke. A short note on a complex topic. Feel free to shoot questions at me in the comments. There are no official NumPy 64 bit builds available for Windows. In fact, 64 bit Windows is not officially supported by NumPy. So, if you are serious about your project, you need to either consider building on top of Unix-like platforms and inherit external quality assurance, or (on Windows) you need to anticipate issues of various kinds, and do extensive testing on your own. One of the reasons is that there is no adequate (open source, reliable, feature-rich) tool chain for creating proper 64 bit builds of NumPy on Windows (further references: numpy mailing list thread, Intel forums). Nevertheless, in many cases a working solution are the non-official builds provided by Christoph Gohlke, created with Intel’s commercial compiler suite. It is up to you to understand the license impacts and whether you want or can use these builds. I love to use these builds. The following steps show a very simple way to get NumPy binaries for the AMD64 architecture installed on top of CPython 3(.4). These instructions are valid only for Python installed with an official CPython installer, obtained from python.org. Download a 64 bit MSI installer file from python.org. The crucial step is to get an installer for the AMD64 (x86-64) architecture, usually called “Windows x86-64 MSI installer”. I have chosen python-3.4.2.amd64.msi. Run the setup. The latter verifies that this pip i) is up-to-date, and ii) belongs to our target CPython version (multiple versions of CPython can be installed on any given system, and the correspondence between pip and a certain Python build is sometimes not obvious). Note: The CPython installer should properly adjust your PATH environment variable so that python as well as pip entered at the command line correspond to what has been installed by the installer. It is however possible that you have somehow lost control of your environment by installing too many different things in an unreasonable order. In that case, you might have to manually adjust your PATH so that it priorizes the exetuables in C:\Python34\Scripts (or wherever you have installed your 64 bit Python version to). Navigate to lfd.uci.edu/~gohlke/pythonlibs/#numpy and select a build for your Python version and for AMD64. I chose numpy‑1.9.2rc1+mkl‑cp34‑none‑win_amd64.whl. The simplicity of this approach is kind of new. Actually, this simplicity is why wheels have been designed in the first place! Installing pre-built binaries with pip has not been possible with the “old” egg package format. So, older tutorials/descriptions of this kind might point to MSI installers or dubious self-extracting installers. These times are over now, and this is also the main reason for why I am writing this blog post. All of these three distributions are recommendable from a technical point of view (I cannot tell whether their license models / restrictions are an issue for you or not). They all come as 64 bit builds. I am not entirely sure if Enthought and ActiveState build NumPy against Intel’s Math Kernel Library. In case of Anaconda, this definitely is not the case in the free version — this is something that can be explicitly obtained, for 29 $ (it’s called the “MKL Optimizations” package). This entry was posted in Python, System administration, Technology on February 24, 2015 by Jan-Philip Gehrcke. 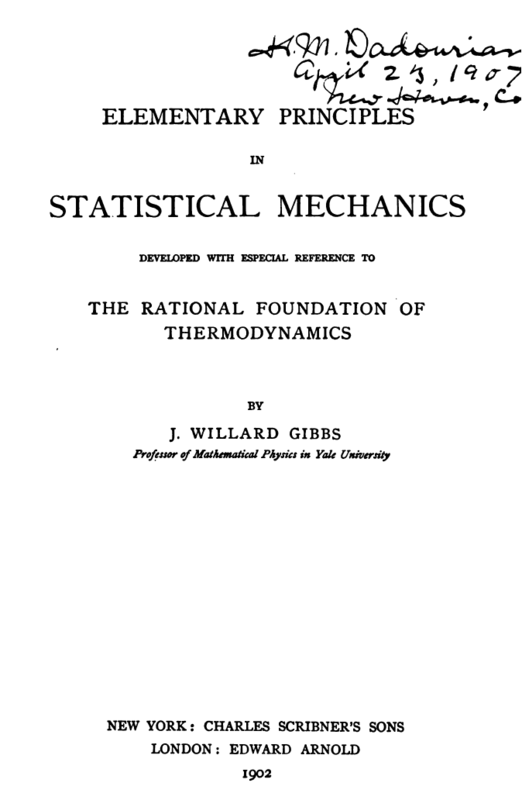 I enjoy digging in historical physics publications, and want to share a document with you that might greatly simplify putting the concepts of statistical mechanics into context. 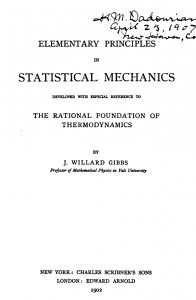 Gibbs himself did an enlightening job in providing this context, in the preface to his essay titled “Elementary principles in statistical mechanics — the rational foundation of thermodynamics”, published in 1902. It is the very same essay that coined the term “canonical ensemble”, so if you ever wondered since when this term is actually used and who has defined it for the first time, this essay will be quite insightful for you. Thanks to Google’s literature scanning program, named essay is freely available (not subject to copyright restrictions) on archive.org. According to the download counter, it has been viewed/downloaded only 540 times (at the time of writing this blog post), which is not a whole lot compared to the importance of the document. It can be obtained in various file formats, including PDF. I recommend giving the preface a read. What follows now are a couple of quotations that I found to be a linear combination of enlightening and funny. Difficulties of this kind have deterred the author from attempting to explain the mysteries of nature, and have forced him to be contented with the more modest aim of deducing some of the more obvious propositions relating to the statistical branch of mechanics. Here, there can be no mistake in regard to the agreement of the hypotheses with the facts of nature, for nothing is assumed in that respect. The only error into which one can fall, is the want of agreement between the premises and the conclusions, and this, with care, one may hope, in the main, to avoid. In the fourth and following chapters we return to the consideration of statistical equilibrium, and confine our attention to conservative systems. We consider especially ensembles of systems in which the index (or logarithm) of probability of phase is a linear function of the energy. This distribution, on account of its unique importance in the theory of statistical equilibrium, I have ventured to call canonical, and the divisor of energy, the modulus of distribution. The moduli of ensembles have properties analogous to temperature, in that equality of the moduli is a condition of equilibrium with respect to exchange of energy, when such exchange is made possible. We meet with other quantities, in the development of the subject, which, when the number of degrees of freedom is very great, coincide sensibly with the modulus, and with the average index of probability, taken negatively, in a canonical ensemble, and which, therefore, may also be regarded as corresponding to temperature and entropy. […] In Chapter XIV, this subject of thermodynamic analogies is discussed somewhat at length. Finally, in Chapter XV, we consider the modification of the preceding results which is necessary when we consider systems composed of a number of entirely similar particles, or, it may be, of a number of particles of several kinds, all of each kind being entirely similar to each other, and when one of the variations to be considered is that of the numbers of the particles of the various kinds which are contained in a system. This supposition would naturally have been introduced earlier, if our object had been simply the expression of the laws of nature. It seemed desirable, however, to separate sharply the purely thermodynamic laws from those special modifications which belong rather to the theory of the properties of matter. Reading such texts — communicating nothing but the pure intent of the original creators — provides a perspective that may greatly simplify understanding and applying difficult concepts. This entry was posted in Science on February 19, 2015 by Jan-Philip Gehrcke.